Finally a true image of the series or movie, and they look pretty good. I hope you have a lot of love and dediacion the series to make it memorable for all fans. That cgi looks amazing! This makes he want to buy the book with that cover. "Hey bunnies your facing the wrong way. I wanna see your cute faces!" This looks pretty good. Hopefully it will look as good when they are moving. Now let's guess who is who on this picture. I think the one on the right is Fiver and next to him is Hazel. Then the one on the left looks like Bigwig with that fur cup (if my eyes are not lying to me). I don't know who the last one could be. Silver? Dandelion? EDIT: I'm curious. Where did @WinterFrostDragon found this cover? I tried to find more information about this new edition, but with no luck so far. 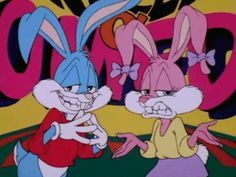 Like I said to Chipster, I'm thinking that extra rabbit could be one of the female characters to give a bit more balance to things? 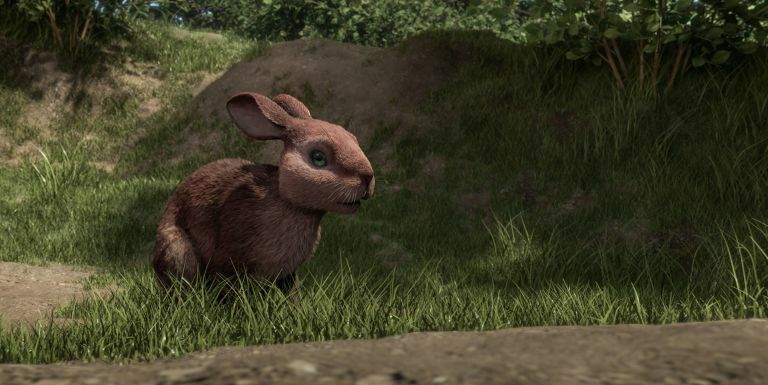 As for the fourth rabbit, it can't be Silver since he doesn't appear in the miniseries. If Meadow's theory is correct, I would say it is gender-flipped Strawberry; initially I thought about Clover but all four look like wild rabbits. Thank you for the link, Chipster-roo. That makes sense. 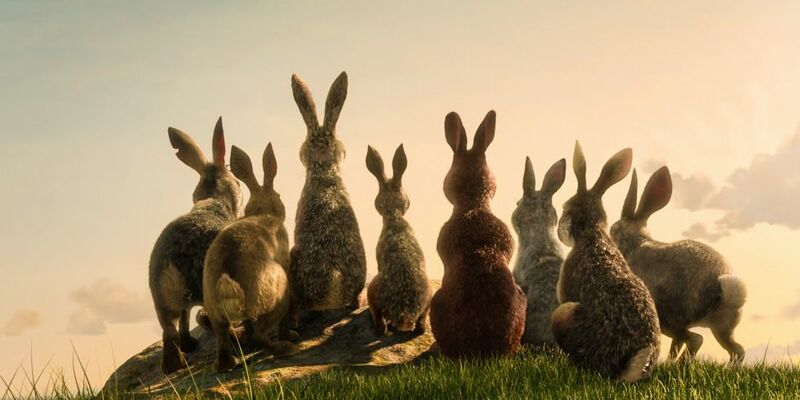 In addition to the fourth character looking like a wild rabbit, it seems this scene portrays the first time rabbits look at the world from the top of Watership Down, while Clover joins the group at later time. Thanks for the information, WinterFrostDragon. It's interesting that they've decided to replace the cover. It might be as you said: they could had posted the initial cover too early by mistake. New Images of the MINISERIES! I'm so excited. The characters look good. I think the rabbit inside the pen is Clover. It feels like we've been waiting so long for an official image. This site also states that Sam Smith will be doing the theme song for the mini-series. The song is called Fire on Fire. here are a few more images. It looks like that the series will be pretty dark. Oh my gosh! Yes, so glad they're going with a darker tone to fit the series. Love it. Hm. I'm gonna have to see this in motion before I pass judgment. In images, well, I dunno. They look a little- plastic, but that's not even the right word. Taxidermic, maybe. 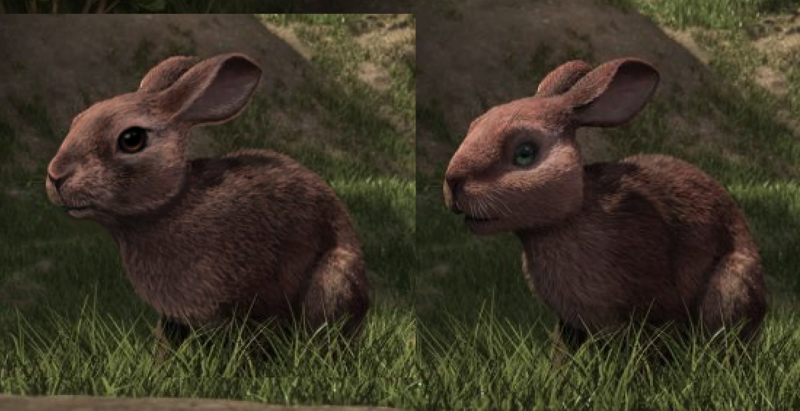 Like they resemble real rabbits more than the old, but they don't appear as alive to me. All the scenes look a little flat and the characters a little stiff. It's like I'm looking at a diorama instead of through a window to another world. 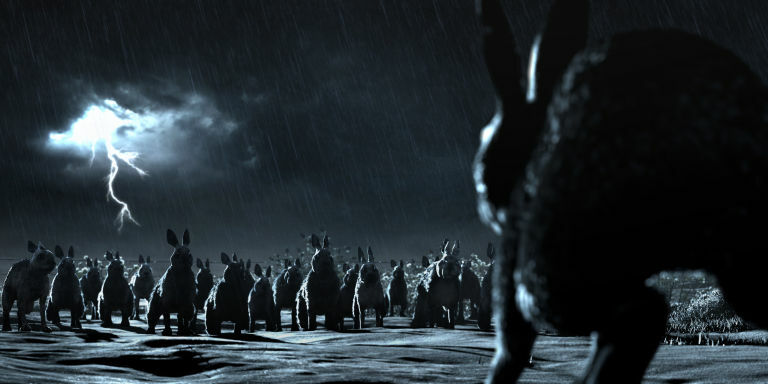 Like in the picture of the rabbit army at night with the thunder, I don't know what it is, but it just looks unnatural and unreal to me. Maybe it's the camera angles? Or the lighting? I can't entirely put my finger on it. I'd almost compare to a PS2 game, but that's not quite right either. It's just curious to me. Like I said, reserving judgment, but all the stills look funny somehow to my eye. I'm kinda pleasantly surprised. I'm glad that all the rabbits have natural fur colours. But, for better or for worse, this all reminds me of the Peter Rabbit TV series (the TV show, not the horrible feature film). But I suppose that makes sense, since both PR and WD were animated by Brown Bag Films. The articles mention that Sam Smith wrote a new song, "Fire On Fire", for the miniseries. This is rather exciting, although this seems to be the official confirmations that there won't be any Bright Eyes, even if it has been speculated for years. Too bad there still isn't a BBC release date though, apart from the fact it will air in two instalments. Also the press release lists Martin Rosen as an executive producer. I'm rather surprised by this, since he said in a previous interview he wasn't working on the miniseries. Come up here so I can hit you with my sword! I would agree that the images make the characters look plastic-y (with a couple of exceptions), but I'm hoping that is just because they aren't the final render (I'm pretty sure that's why). Also, the eyes look dead to me, like they are creepy CG eyes as was the case in the Polar Express. I mean, that is what they are, though; CG eyes. I'll chalk that up to not being the final render too though because I'm feeling optimistic today (wow, that's new). Also the second picture in the older set, with what I assume is Clover in the hutch, looks pretty great. Emotion is actually visible on the face and in the eyes, which is what leads me to believe that the dead-eyed look of the other pictures are, indeed, due to the incomplete nature of the render. The picture with the lightning I would guess is either one of the stories of El-ahrairah, or when Bigwig is escaping with the does and holding off the Efrafans (which I think is the more likely of the two). "Your storm, Thlayli-rah. Use it." And I like the first picture in the newer set too, the lineup of the characters from the back. When they see Watership Down from afar, I think. Overall I'm pleased with what I'm seeing so far and I am looking forward to watching it once it is released. Check out my Deviant Art page. But only if you feel like it. I do think their models need work. 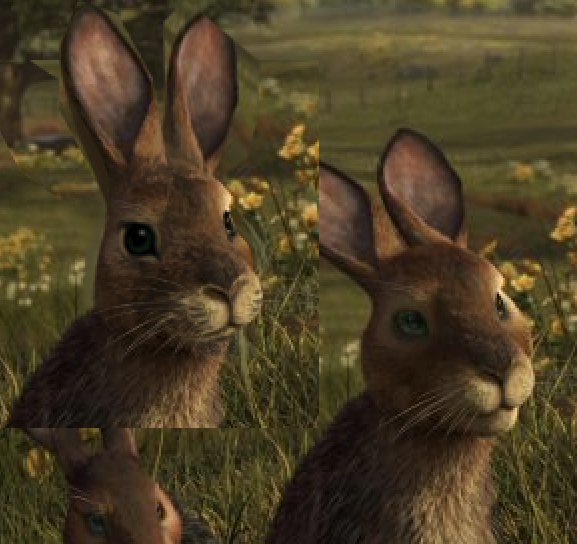 As of now, I'm seeing cat mouths and a few other features that resemble cats/dogs rather than rabbits, too. The greenery looks great. Still stoked.